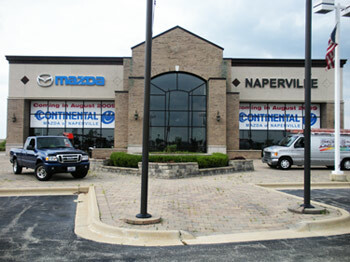 Ever since we opened our doors 19 years ago, we have had a very strong relationship with the high-end car dealerships. 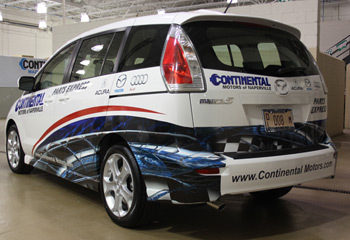 We can take care of virtually anything you have need for. From promotional vehicle graphics to awards for employees that are going above the call. With our vast marketing background, we can help you design products that help you sell your inventory. 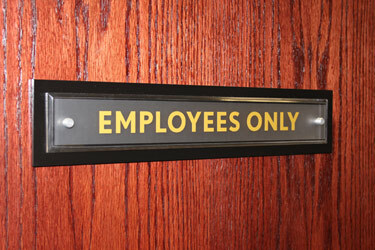 Service specials, promotional items to give to your customers, safety signs and more. This atrium wall extends 2 stories, beautiful maple wood panels. 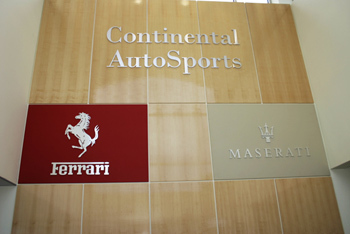 We added the 3D logos to leather wrapped panels & the dealer's name to the wood. All done in brushed aluminum. A parts delivery van that leaves a lasting impression. We call this a half-wrap. This is part of a large sign package that we keep adding to. 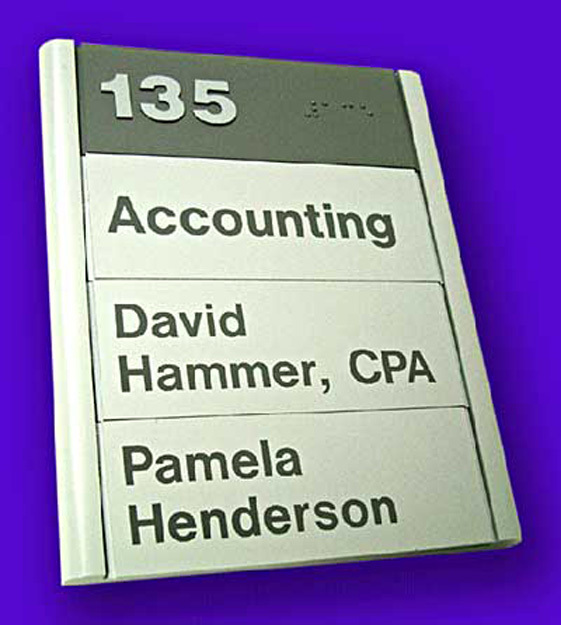 An acrylic backer with a 1/2" beveled acrylic face, aluminum stand-offs add to the look. 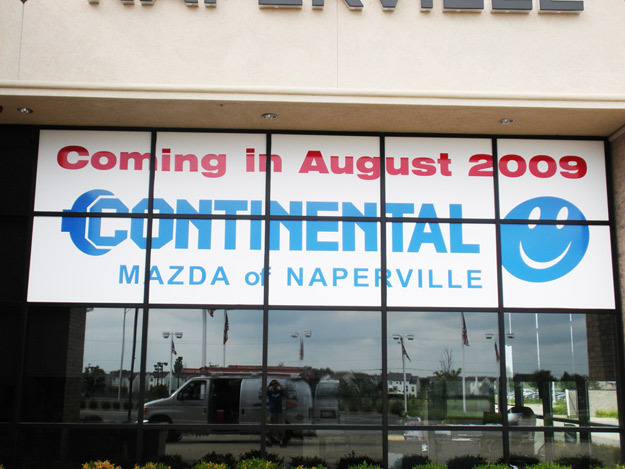 Each decal on the glass was 4' x 5', easily read from the busy street in front of the dealership. This is a tribute car themed after the Herb Thomas NASCAR we did for a great man who recently passed away from cancer. He is truly missed. 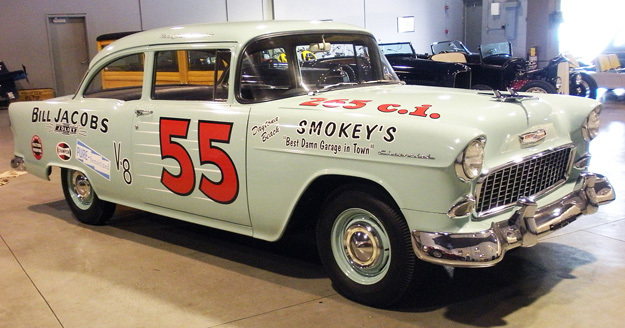 His father started the auto empire in 1955, thus the 55 number. 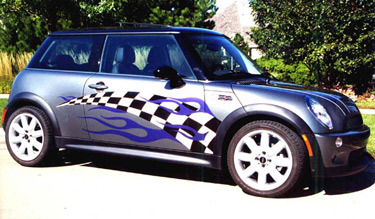 Mini Cooper with a unique graphic......customer couldn't decide on a racing theme or flames...we incorporated both. She was thrilled! ADA Braille sign with magnetic/changeable panels. 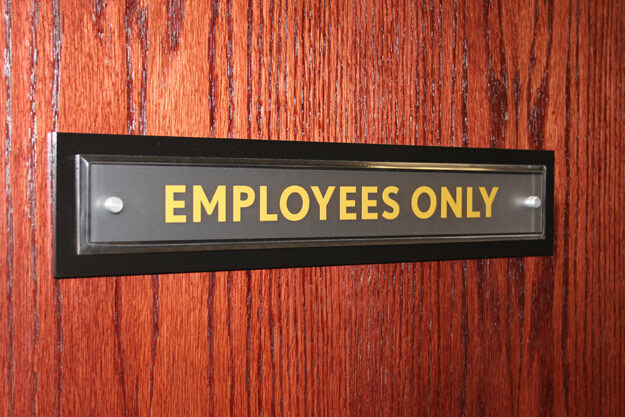 As the staff changes, the sign can change too. 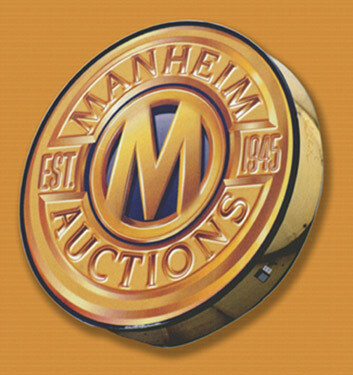 This is part of a number of internally illuminated signs around the auction. 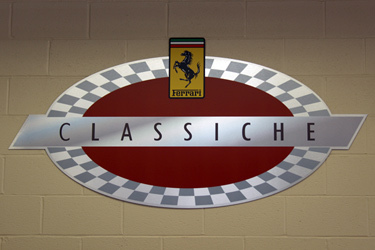 It is 5' in diameter, wall mounted & features a digital print that makes the face appear 3 dimensional. This race garage sign digitally printed on Dibond(2 sheets of aluminum with a polymer core for strength). A nice clean look that will last for many years. 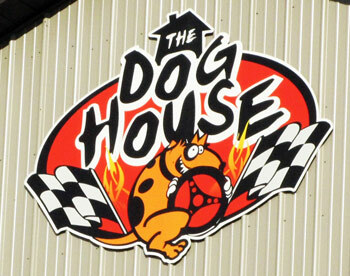 A flat digitally printed wall sign. the material is called Dibond, two layers of anodized brushed aluminum with a polymer center core for stiffness. The metallic qualities of the Dibond really add a rich elegance to the sign. 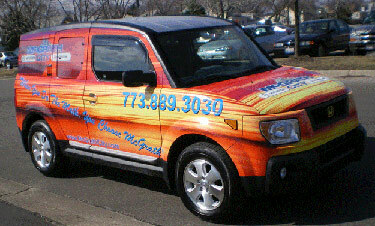 This Honda Element we wrapped to use to promote the dealership in parades, local events & shows. Can't miss it rolling down the road. 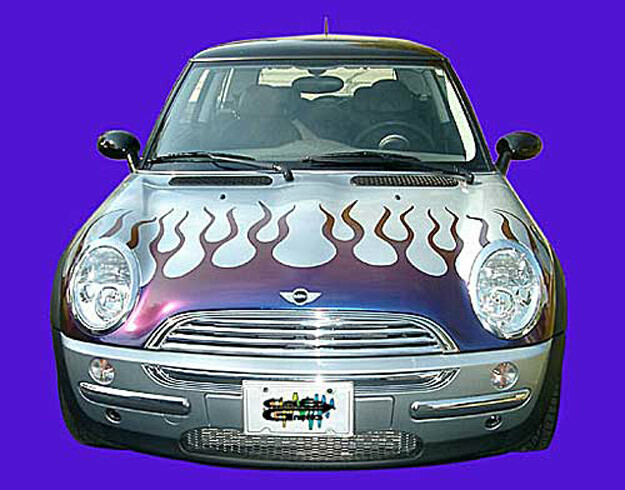 The flames on this Mini are done in color-shifting vinyl. As the sun moves or you walk past the car, the colors change from blue to purple. 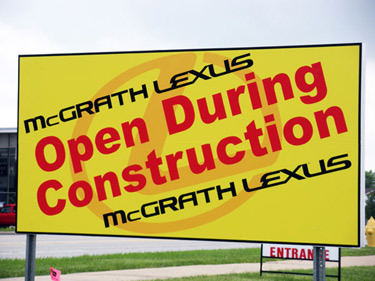 2-sided sign to let traffic know the dealership is open during construction. A beveled Plexi backer for a brushed aluminum face. 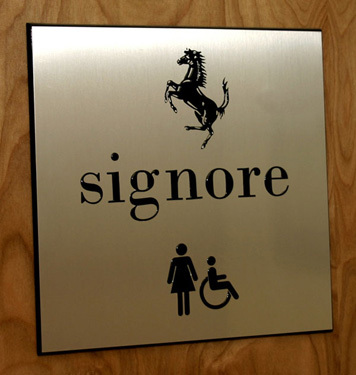 The Ferrari horse, lettering & handicapped logo are done in a 3D resin to add to the look. We enjoyed making these signs. Copyright ©2015 Cutting Edge Graphics Ltd. All rights reserved.